People are still, a decade on, shedding tears over Sega's last home console. We get it, it's sad, but let's not forget that other Sega gaming machine that was killed off by stronger competition. When Nintendo released the Game Boy in 1989, arch-rivals Sega decided it had to have a dog of its own in the portable hunt. 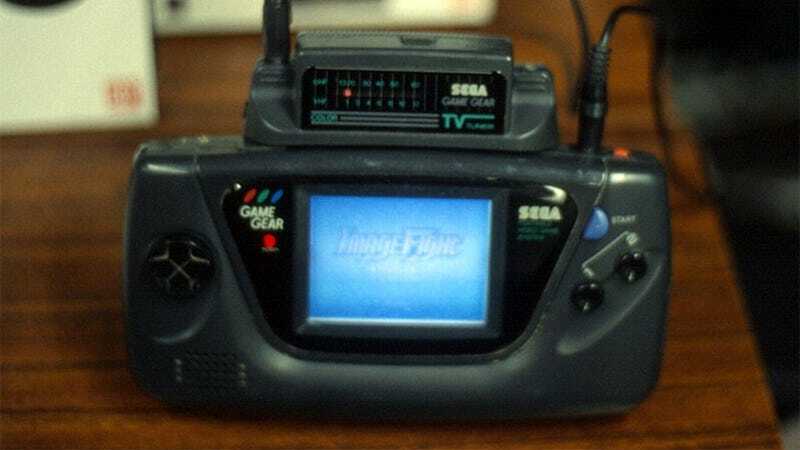 So in October of 1990, just over a year after the Game Boy first hit shelves in Japan, Sega released the Game Gear. Its heart was in the right place, in that it essentially tried to beat Nintendo in a number of key areas. Where the Game Boy lacked colour, the Game Gear could display 32 on the screen at any one time. Where the Game Boy positioned itself as a kid's toy, the Game Gear had a more mature, stylish (for the time!) design, and even went to the trouble of including fancy peripherals like a TV tuner (pictured above). Sadly, that was a terrible idea. Sega instead should have focused on what we now know to be handheld fundamentals, things like build quality, battery life and games. The Game Gear only lasted for four hours on a set of AA batteries, making it either a very expensive (or laborious in the case of rechargables) handheld to keep running (the Game Boy, by contrast, could go for over ten hours). Early models were built like crap. And while Sega released plenty of great games for the handheld, not that many third party publishers followed suit. Its biggest problem, though, was its cost. At launch it was nearly twice the price of a Game Boy, and colour screen or not, that was a tough sell for parents. The original Game Boy (and its iterative successors, prior to the release of the Game Boy Advance) would sell almost 120 million units. The Game Gear, by contrast, only sold a pinch over eleven million. Don't call it a failure! Don't you dare. While it couldn't beat the Game Boy, until the PSP came along the Game Gear ranked as the most successful video game handheld that didn't have Nintendo written on the front. It also stuck around for a very long time, Sega only discontinuing it in 1997 (two years after its short-lived portable Genesis, the Sega Nomad, was released). If you'd like to play some old Game Gear games, they'll be available on the 3DS' Virtual Console next month.